In the afterglow of this year's conference, I was asked to submit an article to the local Sarasota, FL newspaper, The Sarasota Herald Tribune. 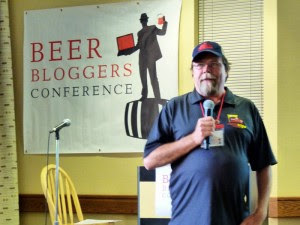 Their "Beer Geek" editor Alan Shaw and I did a Q&A recap of the 2010 Beer Bloggers Conference that was held in Boulder, CO last November. It stood to reason an article would again be submitted for publication again this year. You can peruse it below or you can also read it online at "The Ticket", in The Sarasota Herald Tribune's entertainment section. Portland, Oregon was host to this year’s 2nd annual Beer Bloggers Conference. 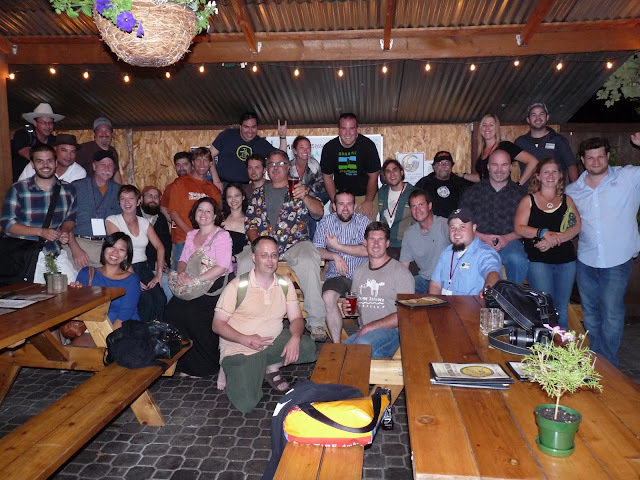 The conference was held August 19th through the 21st, however, many of the attendees arrived on Thursday the 18th and were treated to a pub crawl, make that a brewery crawl, through the city. My flight got me in a bit late for the beginning of the crawl and I missed the tour of Widmer Brothers Brewing. I quickly caught up with the group at Deschutes Brewery, where a lively street festival was in full swing. Beer and food pairings coupled with live bands set the scene for my arrival to the downtown area as hundreds of craft beer lovers jammed the street. We continued on to other great landmark brewers such as the Lucky Labrador, and The New Old Lompoc. On Friday, the first day of the conference meetings, we were introduced to Portland native, Fred Eckhardt, a.k.a. “The Beer Guru.” This sprightly octogenarian literally wrote the book on home brewing back in 1969, long before the practice was re-legalized. Fred regaled us in one anecdotal story after another on his escapades in beer. We quickly realized that he was also likely responsible for the beer blogging movement, before the word "blog" was coined. He is a pioneer in the beer world and we all became very fond of him and his beer chronicles and adventures. Friday evening was the peak of the entire conference as all ninety-five of us rode to the town of Silverton, about an hour south of Portland. There, the folks at Goschie Farms allowed us to tour their one thousand acre farm to watch the beginning of the hop harvest. Two hundred and fifty acres of the farm are devoted to growing hops, a major ingredient in the production of beer. Tractors snipped the eighteen foot tall ‘bines’ from the fields and hauled them into a barn used to separate, dry and bundle the cones. We were spellbound from the scent of hops which lay heavy in the air, as we snapped pictures with our cameras. Afterwards, we were treated to a wonderful picnic on the scenic farm grounds. There was delicious authentic German fare and of course, plenty of great local beer. Saturday’s conference highlights gave us plenty of instructional information about topics such as home brewing, and other subjects about restrictive beer laws as they vary from one state to another. All the presentations were highly informative and engaging. Later that evening, we were all whisked away to Bridgeport Brewing, one of the oldest breweries in Portland. They hosted us to some fine food and beer samplings from their pub and gave us a tour of the brewing facility. Sunday arrived all too soon, wrapping up the last of the presentations and we all bid each other farewell, until next year.